I did not find your contact phone number to talk for clarification. I’ll send you my cell number. I’ll be happy to answer your questions. yeah me too on the cart the discount was not included so i don’t really get it, if i pay 500 for five classes then how will i get 125 back? Unfortunately I don’t have a way to give you a discount at checkout without radically changing my website. I can give you a refund for the extra classes after you pay or I can send you a bill for 400.00. The first class is at full price every class after that is 75.00. For a total of 400.00. Just let me know what you want to do. Sent you an email with bill. Thanks I will pay within this week and for the textbook too, I heard you are writing a new one, when will that be available? I’m confused, why is billing address necessary for the lessons? I actually added that because I realized that many people were purchasing the book with the class but I didn’t have the billing information to send the book. nevermind I have paid for the lessons, how will they work, do I have to wait on this website 9 oclock and something will pop up? I will be sending you an invitation to a webcast. We will be using the app GotoMeeting.com I’ll send more information in the coming weeks. Each class will have a login invitation. We will be testing it all before we start. I ordered the book on friday, when will i get it? Will HP 33s work with Calculator Application? What’s your phone number to talk over? I am Deaf parent and talk through relay service to voice for me. Do you have a july schedule? Unfortunately, my family and I will be on vacation during that month so no. I do offer the classes as a video series. I taped each lesson from the previous week’s training. They are a little bit raw because I haven’t edited them but they are exactly what I taught the students in the class. I am no longer doing the classes till next summer. You can purchase the videos that I used in the class. Send me an email to mathninjavideos@gmail.com if you want more information. Classes were great I learned many new things and tricks that will help me get better and faster. THANK YOU! This was a great experience and I thoroughly enjoyed it! Thank you so much for all of the information you shared. I can’t wait to get back to my team and share with them the different strategies I learned from your course. I am a relatively new coach to a TMSCA team for Number Sense, General Math, and Calculator. Taking the Number Sense classes 1 and 2 and General Math were a great experience! Anthony did a great job of clearly explaining, breaking down how concepts were related, and gave really smart ways to apply math based reasoning to some interesting and complex math problems. These classes have helped my confidence in tackling math problems that I, quite frankly, don’t really remember anymore! Having the videos available to refer back to during the year will be a great resource for me as well. I think these courses were a great investment for me as a coach and I would highly recommend the classes to others! I am the coach from Pearland Junior High West. I would like to take your classes over the summer but I will be on vacation the 2 weeks you are doing them. Can I pay for the classes and do them at a different time? Please let me know what I need to do. I really look forward to seeing what you have to present. 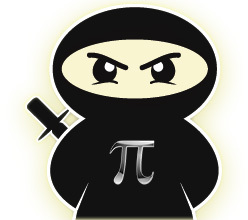 I just sent you an email from Mathninjavideos@gmail.com explaining your options. Let me know if that will satisfy your needs. I absolutely loved this class it was very helpful and a lot more helpful than just reading through the book I can now score higher on my number sense tests than I ever could before and look forward to doing number sense two next year, if I even have to. Great class. I enjoyed it a lot and learned a lot of tips and tricks. Good teacher. He thoroughly explained everything and answered any questions. Pretty convenient too because it is online. I would recommend this class to anyone trying to improve and get faster. The classes did help me, I learned a lot! Thank you!! Had loads of fun while learning a lot! Nice experience, look forward to being in your other classes well. Very thorough and clear explanation of all the tips and tricks to increase speed and accuracy. The teacher was fun and answered whatever questions that were asked. I recommend this to anybody trying to improve their scores in TMSCA tests. This is an amazing class. You can learn a lot while having a thorough, in-depth explanation of what’s going on in the tricks and the lessons. Very interactive and convenient as well. I took Number Sense 1 and 2 which helped explain most tricks that needed to learn. Mr.Gillespey does a great job answering any questions or concerns the attendees might have. This class is truly helpful. Like every other human being, we always have a second thought when it comes to a decision. To be honest, after taking part in the sessions online, it was really worth it. This class packs a punch; Mr. Gillespey thoroughly answers questions and takes the time teaching some valuable tricks. Unlike some online discussions, where one may feel isolated, as the only companion may be his or her own computer, Mr. Gillespey’s class brings liveliness into the “air”. His good-natured humor and the immense amount of patience he has makes him extremely entertaining as a teacher, winning the majority of us with his likable personality. Not only does he actually have the passion to teach students, but it actually makes me wish that I had a better math team teacher. Mr. Gillespey engages students in learning new skills with new materials, turning classes into an experience that, like I said, is worth it. I am a math coach still learning the ropes of TMSCA and all that it involves. I took the Number Sense Level 1 and 2 courses, as well as the General Math course to gain a better understanding of what my students need to be successful. Anthony took extra time with me being a coach to make sure that my questions were answered. He gave personal tips that he uses with his team that you won’t learn anywhere else. I highly recommend taking these classes if you want to take your team to the next level. I’m excited to implement what I learned in the upcoming school year. Thank you Anthony for taking the time out of your summer to provide these great learning opportunities. 28 x 1/2 x 6/7 = 12 12 numbers are relatively prime. This trick is in my new book soon to be published.